How would you feel if every time you and a friend got together it involved work? Isn’t that what we do with our horses? We walk into the stall, slap on the halter and drag them out. Try this the next time you visit your horse: don’t do anything. Sit on a bucket and just be there. Don’t try to touch your horse, or even watch him. Sit quietly for as long as you have time – five minutes is better than nothing; 10 minutes is better than five. Notice your horse’s reaction. Does he avoid you? Does he stare at you from the farthest corner of the stall? Does he approach, sniff you, then walk away? Or does he approach and stay by your side, maybe even knocking your hat off or pulling on your boot? Do this once a week and write about it in your log. 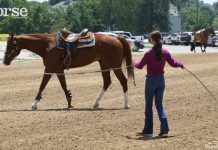 Undemanding time will get your horse interested in you again. My horses are not in stalls-concerning tips 1 and 2. They graze in fields and pastures. They usually come up to me when I come out. Any tips for them? Thanks for the article – I can’t wait to try the suggestions! This is a great idea! I do this all the time with my horses and it works! My horses are out 24/7 My one mare, Indigo came galloping up and promptly sniffed me all over and then stood there licking my jacket. the rest followed over and stood there inspecting me from head to toe. It was funny to see their reactions to me sitting on the gate. My horse is resistant and resents me when I ask him to work, but when I sat by him eating for 20 minutes, he gradually got closer to me. It was pretty funny and heartwarming. When I go to halter my horse I don’t go in the pen but wait for him to come to me. If he doesn’t come right away I do something else and he gets curious and has to stick his nose in my business. Don’t people feed their horses? 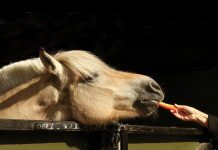 That’s time spent without asking anything of the horse. What about cleaning out their pens, water troughs, etc?